This is where things really got strange for me. I expierenced numerous paranormal events that changed the way I thought about the after life. 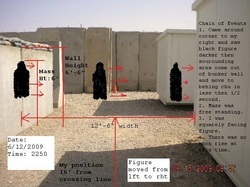 We were only in Iraq a few weeks when I encountered this dark person looking object come out of a concrete wall, pass in front of me and move between two trailers. This occured at night with no moon light present. I put together this photo of the details the next morning. 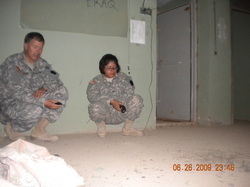 Elvira and I during one of our many bunker investigations. Here's our most famous EVP captured while investigating bunker 1. There's no mistaken what is being said. Here are some of the best disembodied voices and EVPs while in the bunkers. This video presents evidence of a strange black mass that moved around the bunker. I captured this object twice. I also captured strange lights floating around just prior to the black shadow.